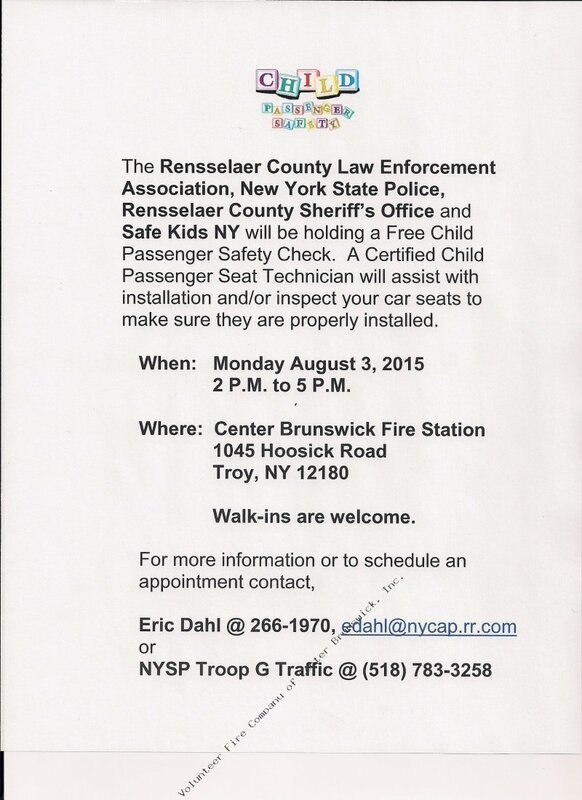 The Center Brunswick Fire Company will be hosting a Free Child Passenger Safety Seat Check conducted by the New York State Police, Rensselaer County Law Enforcement Association, Rensselaer County Sheriff's Office and Safe Kids NY on Monday August 3, 2015 from 2:00 P.M. to 5:00 P.M. at the Fire Station 1045 Hoosick Road, Troy, NY 12180. Walk-ins are welcome. Contact Eric Dahl at (518) 266-1970 or edahl@nycap.rr.com or NYSP Troop G Traffic at (518) 783-3258 for more information or to schedule an appointment.